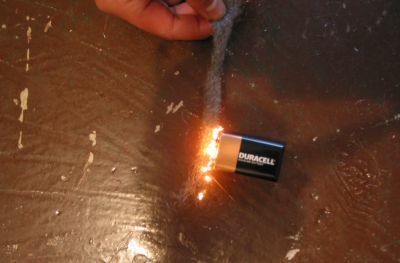 A small battery and fine steel wool can be used to start a fire. Simply bridge the battery terminals with the steel wool and a spark will instantly form in the steel wool. The basic principle involved is that you need enough "electrical current" flowing through the steel wool to get it hot enough to "light." If the steel wool is too "thick" (strands are too large in diameter), then there isn't enough "resistance" in the strands. In that case - you are just discharging the battery - and not ending up getting fire. Another factor is the total voltage that is applied to the strands. The higher the voltage, the more current that will flow, and the hotter the wires will get. (The relationship is linear - twice the voltage, twice the current.) So, the more cells that you stack in "series" the hotter the wires will get. If you stack two cells, then you have just doubled your chances of success. If you put three cells in series, then you are three times closer to success. A nine volt battery is great - since it have a reasonable high voltage - and the terminals are close together. You can ignite steel wool with a 2-cell flashlight. Just take the "end" off of the flashlight and brush the steel wool against the contacts. The best route is to get an assortment of steel wool, and an assortment of batteries - and then to play for a while. Soon it should become pretty obvious what the optimal combinations might be. 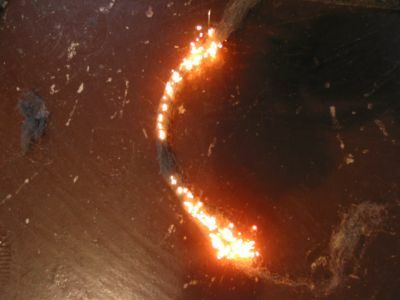 This photo shows the spark immediately forming as the battery terminals are bridged with the steel wool. A 9 volt battery is being used here. The spark travels quickly through the steel wool. This could be placed in a tinder bundle and blown into flame.